Merry Christmas to all our passengers, clients, suppliers, drivers, conductors and mechanics! There’s something about a red Routemaster that lends itself to the cityscape at this time of year. Especially with the destination blinds all lit up and the saloon bulbs switched on. Our first Christmas trips for children, nine years ago, were big budget spectaculars when Clunie got a bit carried away. They featured elves, musicians, handmade wooden toys, fairy lights, huge swags of holly and pine draped from the top deck windows, two types of mulled wine, food, the conductor and driver of course … and let’s not forget Santa himself. Ah yes, Santa. We told him where to get on, near The Meadows. It was meant to be a surprise – the young passengers would help the elves look out for him and together they would tell the conductor and she’d ring the bell to signal the driver to stop. The only snag was that Santa was a first-year Edinburgh University student with limited knowledge of the city. He hadn’t taken in the directions properly and was frantically phoning the bus team for clarification – in the pouring rain. In the onboard hubbub no one heard him. Meanwhile the bus was doing circuits of the Meadows looking out for him… eventually he boarded with a soggy beard and steamed up glasses, to a rapturous audience. 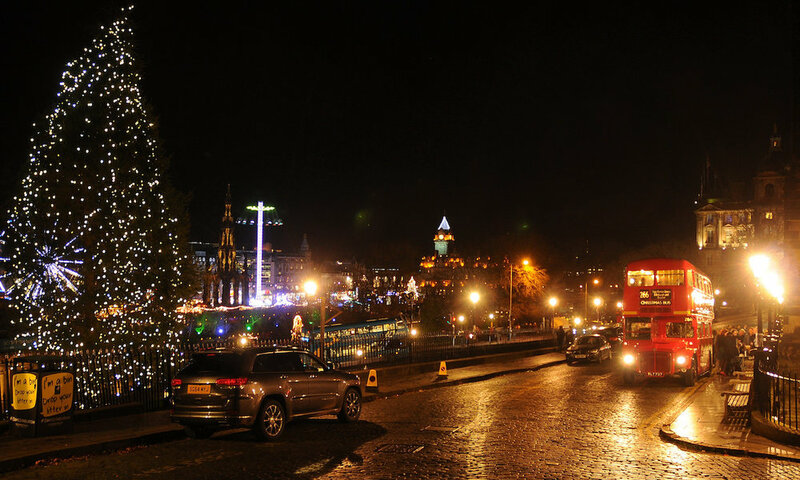 In 2016 wonderful singers from the Edinburgh Steiner School treated us to carols on the top deck, with RM737 perched above the city on Ramsay Gardens. They sounded even better to the accompaniment of the mulled wine. Another year we stopped on the Castle Esplanade and heard Roland Fraser – the artist, teacher and fiddle player – give a stunning solo performance. The other night it was another fiddler, Fiona Moore who entertained our staff aboard RM875 on the way to the annual Christmas party, this time at Hemma on Holyrood Road. But to be honest, our favourite passengers at Christmas are kids, especially when they all wear Santa hats.